Houses in ancient Nazareth were made with a rough stone foundation and mud-bricks made on site. A minimum of wood was used in the roof structure: wood was expensive. 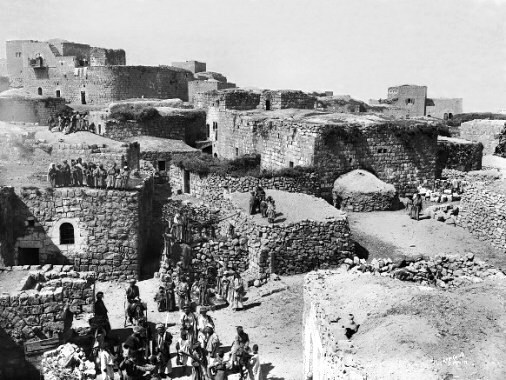 The houses in Nazareth were probably single storey, simple and small. Though a house might have been drab on the outside, inside it was cool, comfortable and pleasant. It was much larger inside than it seemed from outside. 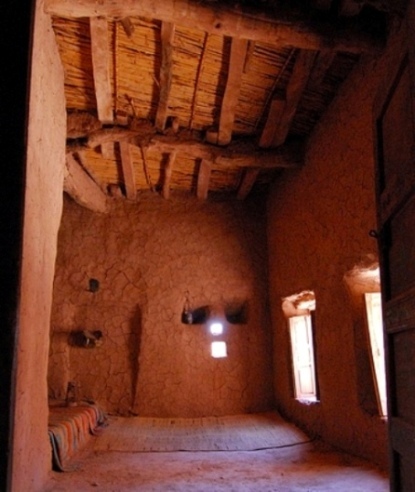 At right is the interior of a mud brick house at Ait Benhaddou in Morocco; it is similar to 1st century AD houses in Nazareth. There was a central paved courtyard with an open drain at the centre, so the stones could be rinsed clean and would not flood with rain. Inside and out the walls were covered with plaster, flattened with a smooth stone. A house may have been one or two-roomed, but it had everything the family needed. There was a raised platform at one end, where they sat and slept on cushions and mats. Usually they ate your meals outside under an awning, but if it was too hot or was raining, they ate inside. The room was stuffy by modern standards because the windows were small, covered with lattice or shutters. Outside on the street there was little traffic. They were too narrow for carts, and even a donkey carrying a bulky load might block them. People avoided the sun and hugged the shadows of the walls. Two or three times a day a flock of noisy boys invaded the streets on their way to the synagogue, where they went for their lessons in Torah. The foundations of a house were stones roughly squared and piled one upon another (see the photograph of the recent house excavation in Nazareth, further down page). These foundations gave some stability to the house, and it needed all the stability it could get. Earthquakes sometimes happened, and the walls of the house, being mud brick, required constant repair. Maintenance of the mud brick surface was a continuing task for the householder. 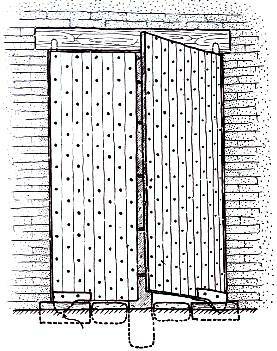 There were few windows in the house, and even those were small and high in the wall – to bar the entry of any intruder. In summer these windows were covered with a lattice cover or with wooden shutters; in winter with thick woolen matting. This kept the house cool in summer and warm in winter. The courtyard and the roof were important parts of the house, used for tasks that needed good light – such as spinning and weaving, and food preparation. The flat roof area might also be used for sleeping, or for drying food or textiles (see the story of Rahab the prostitute). In earlier times the roof may also have been used for bathing – Bathsheba was probably bathing on the flat roof of her house when she was seen by King David (for more on this famous act of voyeurism, go to Bathsheba, her story). Archaeologists in Israel say they have discovered the remains of a home from the time of Jesus in the heart of Nazareth. The Israeli Antiquities Authority said the find “sheds light on the way of life at the time of Jesus” in the Jewish settlement of Nazareth, where Christians believe Jesus grew up. The find marks the first time researchers have uncovered the remains of a home in Nazareth from that time period, the Israeli Antiquities Authority said in a statement. Christians believe that Mary, the mother of Jesus, lived in Nazareth with her husband, Joseph. They believe Mary was in Nazareth when the angel Gabriel revealed that Mary would give birth to the son of God, a baby to be named Jesus. A number of burial caves that date to the early Roman period also were discovered close to the inhabited area during the excavations, the authority said. The discovery was made in the modern city of Nazareth during an excavation in advance of construction of the International Marian Center of Nazareth, which will illustrate the life of Mary. An association in Nazareth plans to conserve and display the home’s remains in the center. It will be built next to the Church of the Annunciation, which stands on the spot where Catholics believe Mary once lived. The Church of the Annunciation is in the heart of Nazareth, above an older church and atop the ruins of a church from the Byzantine period. In the middle of these churches is a cave that was believed in antiquity to be the home of Jesus’ family. Researchers found storage pits and cisterns in the compound of the Church of the Annunciation, many of which date to the time of Jesus, Israeli archaeologists said. In the excavation, a large, broad wall that dates to the 15th century was exposed. It was constructed on top of and used the walls of an ancient building, the statement said. This earlier building — the one that dates to the time of Jesus — consisted of two rooms and a courtyard in which a rock-hewn cistern collected rainwater. Few artifacts were recovered from inside the building — mostly fragments of pottery vessels from the first and second centuries. Also, researchers found several fragments of chalk vessels, which were used by Jews in this period because such vessels were not susceptible to becoming ritually unclean, researchers said. Another hewn pit, whose entrance was apparently camouflaged, was excavated and a few pottery fragments from the early Roman period were found inside it. 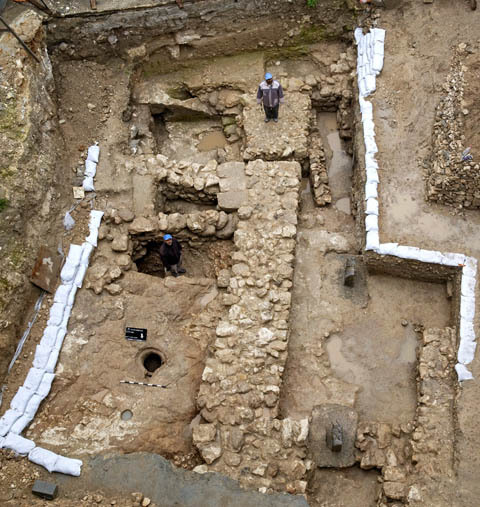 “Based on other excavations that I conducted in other villages in the region, this pit was probably hewn as part of the preparations by the Jews to protect themselves during the great revolt against the Romans in [A.D.] 67,” Alexandre said. 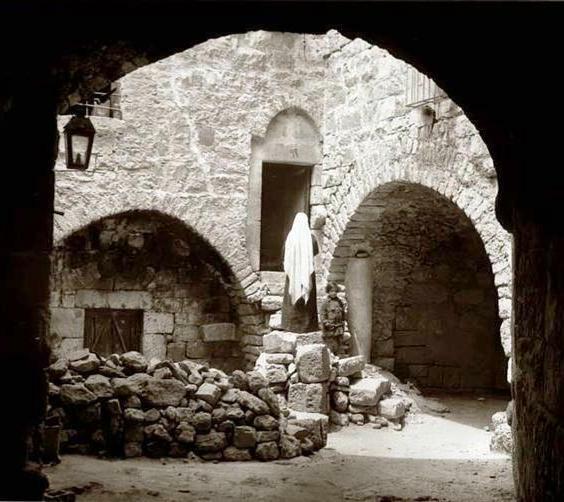 The house in the photograph above is almost certainly grander and larger than Mary and Joseph’s house in Nazareth. 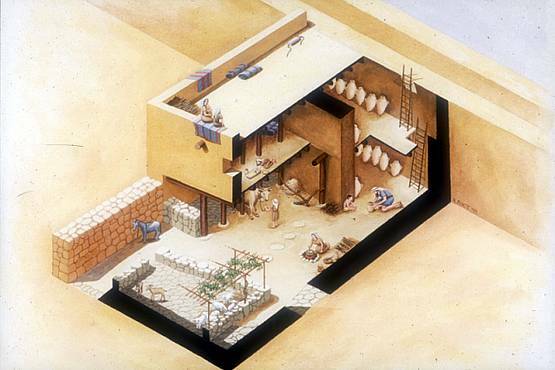 Their house would have been made of mud brick rather than stone and had a courtyard and two/four rooms – a front, public room with an awning, and a private room behind it, and possibly some storage rooms for food and animals. Houses in Nazareth had a flat roof with exterior stairs at the side and an awning of woven goats’ hair to protect against the sun. This was used by the women as a work-space, an extra room. The inside of the house was quite comfortable, though minimalist by our standards. There were raised platforms at one end of the room, with cushions and mats – woven by the women and, like their clothing, embroidered. The walls were covered with plaster, rubbed flat with a stone and painted with geometric patterns. There was hardly any furniture as we know it. Niches were cut into the wall, and these provided storage for bedrolls and clothes. Large amounts of food – jars of oil and olives, etc., were kept in separate storage areas, secure against mice. Archaeological excavations in the Nazareth area show there was a honeycomb of underground rooms under the houses, hollowed out of the soft rock. They were used for a variety of purposes – living quarters in the fierce heat of summer, cisterns for water, grain silos, and storage. Luke’s gospel situates Jesus’ birth in a room like this. The inside rooms of the house were small and dark, so the courtyard and roof were important work areas, with better light for tasks like spinning and weaving. The roof was also a cool place to sleep in hot weather. Rahab, the Jericho prostitute who was one of Jesus’ ancesstresses, hid Israelite spies under the heaps of drying flax stalks on the roof of her house (see Rahab’s story). Down in the courtyard was the cooking area, with an open fire, an oven and an array of cooking utensils. There was a mortar and pestle for grinding small amounts of grain and a covered area where people sat while they worked or talked. This space served as a daily workplace – the weather was dry for most of the year. Here food was prepared, people met, and animals were kept. The courtyard often contained a mikveh for ceremonial purification, and the family latrine as well, which was emptied every day into a communal manure pit. This was the homely setting for the life of Mary and Joseph of Nazareth, and their son Jesus.